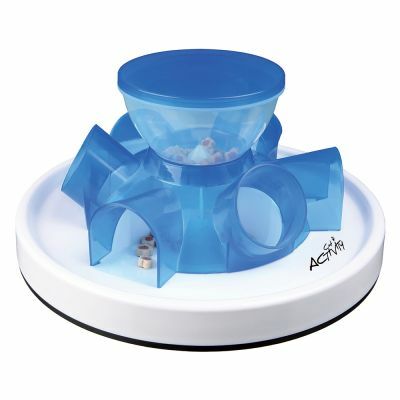 Cat Activity Tunnel Feeder | Free P&P on orders £29+ at zooplus! Fab feeder :"We have 5 cats, two siamese used to fishing biscuits out of dispensers but the other three have never managed to get it and have fat paws. This is great.theyve all taken to using it straight away, hav"
The Cat Activity Tunnel Feeder combines fun with physical exercise and healthy eating habits. The toy trains your cat’s dexterity through play, and challenges your cat’s brain too – ideal for indoor cats, and cats with lower activity levels. The Tunnel Feeder can be used with cat treats or dry cat food kibble. Simply fill the funnel with treats or dry food, screw the lid on top, and place it in front of your cat. The secure lid fastening means your cat has no chance of getting to the food through the top. Instead, the treats will fall into the six tunnels, and your cat will have to fish them out one at a time using its paw! The different angles of the tunnels make it more of a challenge for your cat to reach all the treats, encouraging it to eat slowly, and in smaller amounts. Giving your cat its daily portion of dry food through the Cat Activity Tunnel Feeder in this way can support your cat’s digestion and help your cat to maintain a healthy weight. 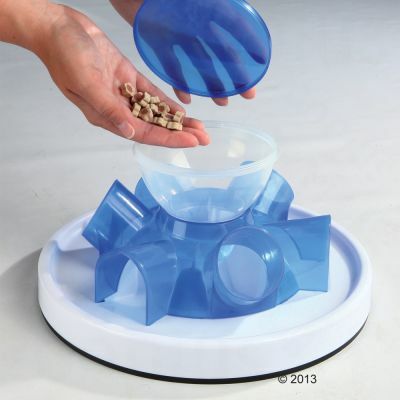 The Cat Activity Tunnel Feeder is dishwasher-safe, and should be cleaned regularly. Caution: Small cats younger than 3 months old or weighing less than 1.5kg may get their heads stuck in the tunnels, and should therefore always be supervised when using the Cat Activity Tunnel Feeder. We have 5 cats, two siamese used to fishing biscuits out of dispensers but the other three have never managed to get it and have fat paws. This is great.theyve all taken to using it straight away, have no fat paw problems and seem to love using it. Excellent. Happy household. It was recommended that I buy a slow feeder for my pig of a cat as he scoffs food quicker than you can fart. He has had this for several months now and he always has his biscuits in this now and it has really slowed him down on his eating as he only has one biscuit at a time. It's brilliant and doesn't take a great amount of intellect to figure it out which I've found he has struggled with on other feeders. I'd definitely recommend for slowing down fat cats! My cat has a tendency to eat her dry food very quickly, so I thought i'd try this to see it would slow her down. It does just the trick! She eats her food a lot slower and leaves some to eat for later, rather than eating it all at once. Great product. We bought this as an alternative for feeding as we have 6 cats and thought it would keep them entertained. They loved it, and we keep the rotation of interesting treats going so it never gets boring. Well worth the money. It is a good product to slow down eating and to give your cat some interest and activity in its food - but the bowl seems very over-sized for a daily portion of kibble and/or treats. It might work better with biscuits (but I don't know I haven't tried) but our cat's daily 60g of, even medium, sized kibble goes straight through the storage bowl to the tunnels and the bowl looks like it would hold two days worth of our cat's food. 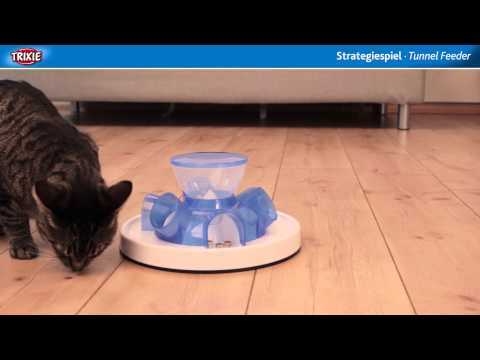 I prefer the Stimulo Feeding Bowl and NORTHMATE Catch Cat Feeder. Elvis loves his new feeder! It's got lots of holes big enough for large paws, a cat proof screw top (no cheating)he has to walk around it and think. It's robust easy to clean and stops him woofing food down in seconds. This is our fifth Trixie toy and they are by far the best cat toys we've come across and so far Elvis loves all of them. Perfect for entertaining indoor cats. Excellent to slow down a greedy cat! My cat is totally food orientated and I have to day that this has worked a treat at slowing him down! This is a really reasonably priced product and really does encourage the cat to eat more slowly and enjoy a new challenge.